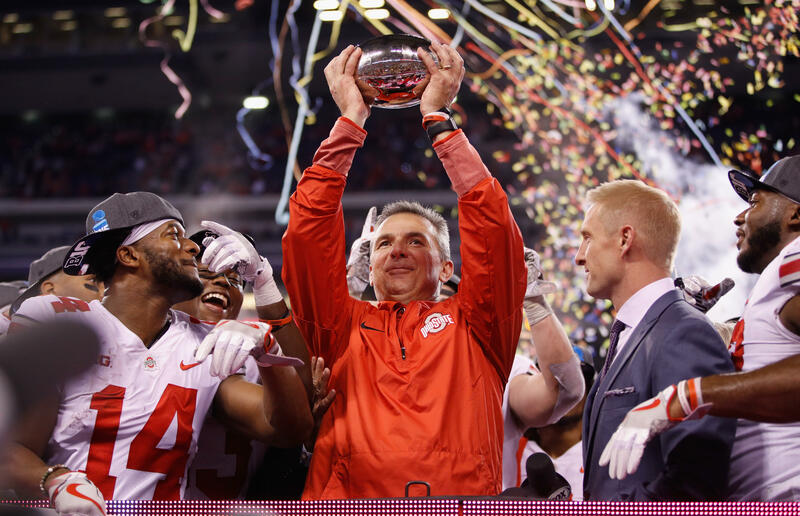 Ohio State University put coach Urban Meyer on leave on Wednesday while it investigates allegations the football coach knew about a 2015 domestic violence incident involving a former assistant years before the assistant was fired last week. Meyer will be on paid administrative leave and Ryan Day will serve as acting head football coach, the university said. In a statement, Ohio State said it is "focused on supporting our players and on getting to the truth as expeditiously as possible." Meyer issued a statement saying he and athletic director Gene Smith "agree that being on leave during this inquiry will facilitate its completion. This allows the team to conduct training camp with minimal distraction. I eagerly look forward to the resolution of this matter." The former assistant, Zach Smith, was fired last week after an Ohio court granted a protective order sought by his ex-wife Courtney Smith. In an interview with the sports news site Stadium released on Thursday, Courtney Smith said she told Meyer's wife Shelley Meyer that she was being abused in 2015. Courtney Smith said her then-husband had assaulted her during an argument about their young children. Smith obtained a restraining order shortly after the incident but charges were never filed. "Shelley said she was going to have to tell Urban," Courtney Smith told Stadium said. "I said, 'That's fine. You should tell Urban. We can't have somebody like this coaching young men.'" Meyer said at an appearance in July that he was not aware of the situation until recently, CBS Sports reports. "I got a text last night that something happened in 2015, and there was nothing," Meyer told reporters at the Big Ten Media Days, adding, "I don't know who creates a story like that."